If you’ve spent any time visiting our blog site, you’ve no doubt been ‘introduced’ to the “girls”. No, not our daughters who prefer to stay nameless and out of the “blogosphere”, but our four-legged ‘daughters’ affectionately referred to as Pepper, Andie and Jasmine. All three dogs have been rescued from the pound. Each one has a special story–like all rescue dogs–that endears them to our home, and all three are FIRMLY in control of this household. Pepper is the oldest of the trio having celebrated birthday number 10 this past December. We really aren’t sure of her birthdate other than the fact that we adopted her in the early spring of 2003 and estimated that she must have been born in late December. A survivor of distemper; Pepper beat the disease by being submitted (by her new owners – aka us) to a series of vaccines for 14 consecutive days early on in her home life with our family. She has rewarded us with loyalty and a certain sassy attitude that comes with getting older. She’s the queen of the cottage and isn’t afraid to let everyone know it. Her special talent is being able to bark–on cue–to the song, “Who Let The Dogs Out?” She also does a spectacular imitation of the sheep from the movie, “Babe”…her “BAH-RAM-YOU” is spot-on from the picture! Andie joined our clan in 2005. Brian was supposed to get tickets to a casino night fundraiser for the Humane Society. Unfortunately, he and daughter #1 (and a friend) made the mistake of going down the walkway where the dogs were all talking and carrying on. . .at the very end of the kennel was a beautiful dark red lab/setter that looked completely out of place in a humane society kennel. The wagging tail was further evidence that this dog may be here under false pretense, and legend has it when Brian and Andie’s eyes met, it was ALL OVER! Andie is bigger than Pepper, but far more reserved and obedient. She definitely does NOT like getting into trouble. One of her most admiring traits–when being corrected, er, yelled at–is to squint her eyes and curl her lip showing her teeth while wagging her tail as fast as possible. Clearly, the correcting comes to an end with a serious laugh. . .which she takes as good news! Finally, Jasmine was the result of a family ‘expedition’ to replace a previous family dog that had to be put down after 14 years of loyal companionship to the family. It was during spring break of 2009 and for some unexplained reason (to this day) we ALL felt the urge to visit the Humane Society (nothing there); a No-Kill Shelter (only puppies-not a chance) and finally, the Pound. Kind of a sad walk through the kennels to see the number of dogs abandoned by owners and coming upon this boxer/sharpei mix. . .in a cage next to a couple of roosters–well, we’re pretty sure Jean and Jasmine had instant karma when she gave Jean the, “please get me out of here” eyes. Jasmine has been a part of the family ever since. . .although somewhat of a loner when we brought her home, she is now “EVERYONE’S” best friend. Why on earth spend all of this time talking about dogs? 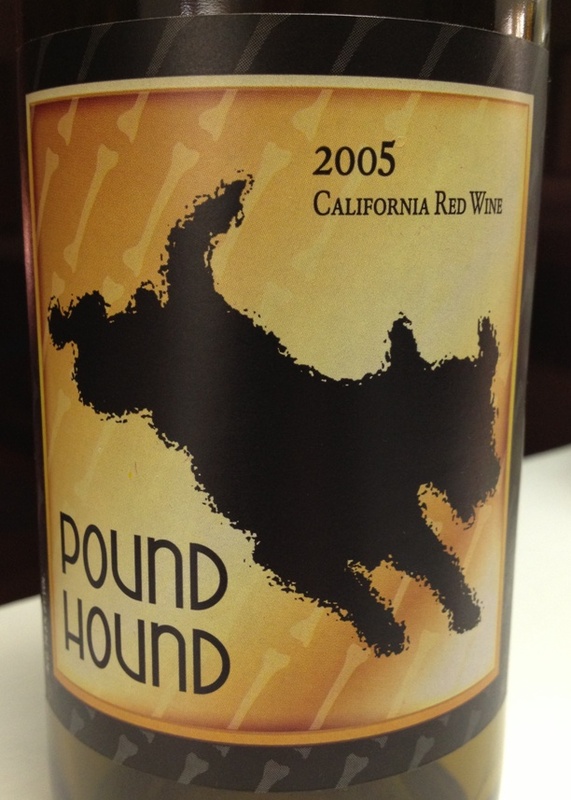 Tonight’s wine–we found at Gabriel’s–is a red blend– a 2005 Pound Hound from CV Vineyards in Geyersville, California. It seems that the owners of the business are pretty fond of their dog–rescued from the pound–and not only did they give their wine a nod in the direction of the dog, but also committed to contributions to the pound for bottles sold. Admittedly, it took a while to coax this one out of it’s ‘cage’. . .the nose was earthy and the color was not quite what we’d expected. To enhance the wine, we decantered it for 45 minutes to an hour and amazingly, it opened up and was fruity, oaky and palatable. A quick check of their website yielded much information about their cause but little information about this 2005 wine. In fact, their 2009 wines were sold out, so not much help, but a fun wine nonetheless, and at $11 a bottle, we thought it’s worth a shot for the ‘girls’. Not everyone is a dog lover. We know lots of folks who are crazy about their cats; their birds, their ferrets. . .you name it and we tend to be crazy for them – in fact, don’t plan an extended visit to Casa de Vino and not go home with a bit of the dogs as a souviner. Why–we even know some people who are crazy about their KIDS!!! Imagine that. We mentioned it last night, but will bounce back there for just a second – tonight’s blog is a nod and tip of the hat to a great man – Jean’s Dad, aka Bill, aka Brian’s Father-in-Law. Bill turned 85 today – and no greater man has walked this earth. He has withstood trials that none of us should – and made those around him better for being part of his life. He is a faith-filled, graceful man – passionate about his beliefs, his family and his friends. He has never met a stranger and can give a hug that sustains you for months. He is a guy that doesn’t shy away from adversity (and has a bit of a wicked sense of humor) – and makes you just feel special. He is generous, not only to his family and his Church, but to those less fortunate. He has taught our daughters well about giving away your time, talents and treasures – a lesson they understand and cherish. Being the patriarch to a family of six, yes six, girls is no easy task – but one he took on and should be proud of. Add in another clan of three more girls later in life and you have the making of a shy saint. He connects not only with all nine of his “daughters”, but his brood of nine grandchildren (and one new great-grandson) as well. He makes each one of us feel special and important in his life. Men like this do not come around every day – they are truly a gift from God above and gentle reminders that we are so loved and examples for us to follow. So, Dad – Bill – Papa – Poppop – Grandpa Peacock – on this special day, and every day – please know how much you are loved, respected and appreciated. God has great plans for you. We love you more and more each day! As the weekend winds down and the new week is on the door step, please remember to enjoy your favorite wine responsibly (so you can support your favorite cause! ), and recycling whenever possible helps reduce trash in our landfills. Categories: Uncategorized | Tags: Animal Shelters, Gabriels Liqour Store San Marcos, Geyersville California, Pound Hound Wine, Red Blend | Permalink.